The Law Firm of Hunt, Hamlin & Ridley is prepared to respond to the diverse needs of today’s society, based on extensive knowledge and experience in a diverse array of law specialties. Whether you are a Board of Education or a Public Housing Authority looking for General or Labor Counsel, a Municipal Corporation Counsel seeking outside Counsel to handle defense litigation, Workers Compensation or other matters, an individual charged with a criminal offense, an employee wrongfully terminated or denied a promotion, a person involved in an automobile accident, or a company in search of representation or advice, the need for competent legal counsel is an absolute necessity. The Law Firm of Hunt, Hamlin & Ridley is “Prepared for the Challenge”. Founded in 1995, after working together at a previous firm, Ronald C. Hunt, Raymond L. Hamlin and Terry Ridley formed a partnership that would become the source for many public and private entities and individuals, seeking competent and effective legal services. In 2012, the firm named Kenyatta K. Stewart as a Partner. 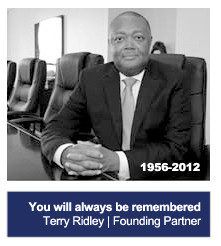 Kenyatta made firm history as the first partner beyond the founding partners. Today, the Law Firm of Hunt, Hamlin & Ridley is recognized as the largest African-American owned law firm in the State of New Jersey with a wide range of expertise and skilled lawyers on staff to handle many types of legal matters. With extensive experience in Education Law, Hunt, Hamlin & Ridley has built an excellent reputation in providing general counsel, and labor and employment counsel services for Boards of Education throughout the State of New Jersey. Hunt, Hamlin & Ridley also has experience in the area of contract negotiation for union and non-union employees including but not limited to employment contracts for Superintendents of Schools, Assistant Superintendents of Schools, Architectural Contracts, Business Administrators, Food Service Contracts, and various non-personnel related contracts. Appearances before the Office of Administrative Law in tenure hearings, residency hearings, special education matters, non-tenured Petitions of Appeal and expulsion matters. Appearances before the Public Employee Relations Commission (PERC) in Unfair Labor Practice complaints, Superior Court litigation involving bid challenges contract interpretation, and various Orders to Show Cause. The firm also represents boards in district-wide expulsions, increment withholdings, labor negotiations, fact findings,arbitrations, School Construction disputes and other types of litigation. The firm has appeared in court on matters ranging from students charged with criminal offenses, petitions of appeals for teachers and/ or administrators charged with corporal punishment, criminal offenses, tenure hearings for insufficiency, incompetence, conduct unbecoming a teaching staff member, excessive absenteeism, tenure rights following a reduction in force, contract disputes between administrators and the board of education and other related matters. Management and Stop Loss, Turnkey Construction, privatization, capital improvements, the Public Housing Conventional Program, Section 8 Voucher Programs and the Section 8 Rehabilitation Program. For most people, understanding criminal law is based upon hearsay or what people see on TV, movies, etc. The experience is extremely different when someone becomes personally involved in the criminal justice system—reality sets in and comes into focus. The need for information and assistance is important in these circumstances. Hunt, Hamlin & Ridley has successfully represented clients in Municipal Court, Superior Court and Federal Court in all types of criminal matters. The firm is committed to the defense of people charged with criminal offenses. The law mandates that all persons charged with criminal offenses are innocent unless and until they are proven guilty beyond a reasonable doubt. At Hunt, Hamlin & Ridley we vigorously defend all types of cases. Our services have resulted in dismissals of indictments and acquittals in bench and jury trials in cases ranging from homicides, attempted murders, aggravated assaults, drug cases, armed robberies, conspiracies, and reasonable pleas for persons seeking an opportunity to resolve their cases in light of their involvement in criminal activities. A portion of the practice is also dedicated to appeals. “Civil rights” are the rights of individuals to receive equal treatment (and to be free from unfair treatment or “discrimination”) in a number of settings including, but not limited to, education, employment, housing, and certain legally-protected characteristics. Every employee is entitled to protections under a number of Federal and State employment and anti-discrimination laws. Given the wide variation in State employment and anti-discrimination laws, it is important that your lawyers understand the employment laws in your State as well as Federal Law and procedure. Hunt, Hamlin & Ridley has an extensive civil rights/employment litigation practice. The firm has represented individuals for claims against employers for race discrimination, age discrimination, sexual harassment, wrongful termination, failure to promote claims, Americans Against Disability claims and other employment related claims. The firm has also successfully defended charges of racial discrimination in the workplace, sexual harassment and other forms of discrimination on behalf of employers. Our extensive experience on the side of plaintiff’s and defendant’s gives the firm a unique perspective which inures to the benefit of our clients. Hunt, Hamlin & Ridley has experience in all aspects of litigation that arise from the construction process, including scope of work issues, change orders, negligent design claims, defective workmanship claims, contract balance claims, acceleration claims and delay claims. Many owners/developers, design professionals, contractors, subcontractors, and material suppliers have been successfully represented by the firm. Hunt, Hamlin & Ridley has extensive experience with issues concerning federal and state contracts. The firm assists their clients in parallel areas of construction law, including contract negotiation, contract formation, and the adaptation of standard contracts. Many contracts have also been drafted for projects in order to meet the particular needs of our clients. Hunt, Hamlin & Ridley represents owners/developers, design professionals, contractors, subcontractors and material suppliers in drafting and negotiating documents for their projects. The firm also routinely advises clients on insurance and surety issues such as insuring the Construction Project, obtaining and enforcing performance bonds and payment bonds and other related surety issues. We are also prepared to litigate insurance and surety bond cases on behalf of owners/developers, as well as contractors. Hunt, Hamlin & Ridley has represented businesses of all sizes in all types of matters. Hunt, Hamlin & Ridley’s reach allows clients’ businesses to be in a position to quickly and efficiently address issues whenever and wherever they may arise. The firm has represented corporations in various matters including but not limited to commercial real estate transactions, employer/employee related issues, contract interpretation, the acquisition of property, collection matters, negotiation of contracts and real estate related issues. Corporate clients benefit from commercial contract review, advice in manufacturing, outsourcing, supply, distribution, service, employment, technology and licensing. Hunt, Hamlin & Ridley also advises and represents clients in many types of transactions, including mergers, acquisitions, divestitures, spin-offs, restructurings and reorganizations; alternative entities (partnerships, limited liability companies, business trusts, etc. ); joint ventures and employment, licensing and other corporate arrangements. In our diverse practice, we handle the above situations and events for clients from mid-sized and early stage to larger corporations, both privately and publicly owned. Penrose-Pinder Corporation Question Mark Entertainment, Inc.
RayZo Marketing & Communications, Inc.
Martin Luther King Drive Neighborhood Development Corp. If you believe you have sustained a personal injury due to the fault or negligence of another, it is important to act immediately in order to preserve evidence and avoid the potential waiver of your claims. Even if you are not certain that you wish to initiate litigation, we recommend that you contact an attorney in order to learn about and preserve your rights. Our Personal Injury & Medical Malpractice Group has lawyers with extensive experience in this area. We represent those injured in accidents and provide clients with an evaluation of their personal injuries including; Wrongful Death, Automobile Accidents, Malpractice, Products Liability, Head/Brain Injury or other injuries as a result of accidents. Our lawyers are experienced in personal injury and medical malpractice cases in order to maximize the recovery for our clients. We know that it is important to understand your rights when attempting to seek legal redress. All work is performed in this area on a contingency basis and therefore the firm will not be entitled to a legal fee unless we are successful. Hunt, Hamlin & Ridley has represented various clients in all types of contested and uncontested divorce matters, custody disputes, the equitable distribution of property, name change applications, child support claims, domestic violence/ Orders of Protection matters, crimes involving juveniles, visitation issues and other matters related to the family. Our approach is that of care and concern for our clients. Hillside welcomes new business administrator Ray Hamlin, Esq. © 2013 Hunt Hamlin & Ridley. All rights reserved.